Spring is right around the corner and many couples who are having spring weddings are finalizing the details of the big day. 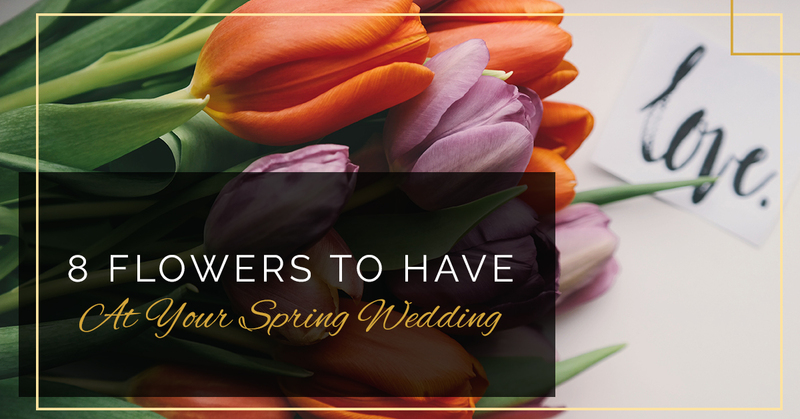 Flowers are a big part of any wedding, but are especially important for a spring wedding. As your wedding rentals vendor in Fredericksburg, we have wedding linens and decor to match any color scheme or flower arrangement you choose. Once you know what your flowers will look like, make sure to reserve your linen rentals and wedding flower displays! Keep reading to learn about some popular wedding flowers that will be blooming in spring. Irises are an asymmetrically shaped spring slower with soft petals and is a popular addition to spring wedding bouquets. Usually available in white, yellow, and purple, irises can seamlessly fit into any wedding color scheme. Peonies hit their peak in spring and are known for their luscious head full of petals and their sweet scent. Peonies come in a variety of colors but are usually white, peach, or pale pink. There are many varieties of tulips and most of them bloom through winter and into late spring. The Dutch tulip is the most common variant and comes in a wide variety of colors, so regardless of your choice of wedding linen rentals, this flower will look wonderful. These soft-petaled flowers look similar to poppies but are known for their dark jewel-toned colors. If these play a primary role in your wedding flowers, you might want to rent wedding linens that are a lighter color so these springtime flowers pop. Hyacinth flowers are a little rarer but help create unique textures in a wedding bouquet due to their stock-like shape. Grape hyacinth come in a deep purple color and will pop against a lighter tablecloth when used as centerpieces. Traditional hyacinth, however, comes in various colors so you can rent linens to complement your flowers. A traditional wedding flowers, you can find roses year-round but they are more available in spring. While classic red roses always look good in a centerpiece, roses come in just about any color you could imagine and can make a beautiful statement against white tablecloth rentals. The beautiful calla lily peaks in late spring and is known for its sturdy singular petal that wraps around a bright yellow spike called the spadix. While these come in a few colors, the most common color to see among wedding flowers is white. If you are using calla lilies in your wedding flowers, you can pair them with tablecloth rentals of any color. The ranunculus is a popular springtime wedding flower thanks to its dense arrangement of delicate flowers. If you are choosing darker linens to rent, opt for ranunculuses in the white to pale pink range, and if you are renting white tablecloths, choose a brighter ranunculus color to create a beautiful contrast. Which Wedding Flowers will Complement Your Tablecloth Rentals? When it comes to renting linens for your springtime wedding, you can count on Signature Event Rentals to have everything you need. We offer wedding linens for rent in a plethora of colors to match any color scheme brilliantly. Whether you are choosing elegant white floral centerpieces on white linens or opting to add some whimsical bright colors, we’ve got you (and your tables!) covered. Whether you are looking for tablecloth rentals, cloth napkin rentals, or both, Signature Event Rentals can make your wedding day look spectacular. We have linen rentals for all shapes and sizes of tables — and you can even rent your tables and chairs with us, too, so you don’t have to try and coordinate multiple vendors. We are your one-stop-shop for wedding rentals in the Fredericksburg area. Add your favorite linens to your wishlist today!